“I think it’s actually the wrong name; it shouldn’t be the Australian Vaccine network, it should be the anti-Australian vaccine network”, Radio Host 2UE radio, Sydney Australia. For more detailed information go here and here. The McCafferys have posted a media release here where you can also find a statement from Ken McLeod who submitted the original complaint. Seems like a slap on the wrist right? At first yes, but since the story has spread across the webosphere, an unexpected result has emerged and one that makes me very pleased indeed. 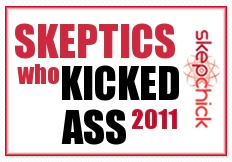 (I even happy-danced with @skepticzone in Las Vegas airport yesterday, apologies if you had to witness it). But as they say, the truth eventually comes out and it seems the game is up for Meryl “I’m pro-choice” Dorey. Even the normally sympathetic morning television host Kerry Anne Kennelly, whose show consists largely of light entertainment and info–mercials, apparently asked Meryl twice why she was anti-vaccine. In an email sent to her Yahoo Group, Meryl described how she had initially refused to appear on the show, eventually relenting under the condition that she was given 6 minutes to discuss the HCCC findings and that she was to have the questions ahead of time. (Coincidentally the website 6minutes were the first to break the news of the HCCC report and wrote a less than flattering piece about the AVN). Why the exclamation mark Meryl? I’ve mentioned this before, but remember when you appeared on radio to defend your Australian Skeptics Bent Spoon Award? Blah blah blah, rhetoric, rhetoric, deflecting the question. (You can hear the full audio here). But c’mon, I’m just being a big meany. And afterall this is only one example. And as a scientist I require repeatable results. Oh wait a sec..
“There will come a time – I pray to God that it will happen in my lifetime – when those who have pushed vaccines upon innocent, helpless babies – doctors, pharmaceutical companies, government officials – will be proven to have lied and cheated these instruments of death into our children’s bloodstream. When that occurs, the outcry will be heard around the world and there will not be enough hiding places on the globe for these murderers to hide or enough money to pay for compensation. Of course, it will be too late for the babies, like this poor child, to be saved. But we will be able to take satisfaction from the fact that never again will anyone have to be pushed to poison their child because for once and for all, it will be known as poison and we will all wonder how it was we fell for the vaccine lie for as long as we did”. Does that sound like a pro-choice message to you? “Love them, protect them, never inject them”. So not only are parents finding out that the AVN has not been completely truthful about their agenda, they also harassed the parents of a 4 week old baby who died from complications associated with a vaccine preventable disease. Pro-tip: this is unlikely to endear you to parents Meryl. Just saying’. If you haven’t seen the Lateline piece, DOET NOAW. It is a thoroughly researched and sensitively compiled piece by award winning journalist Steve Cannane (insert fan-girl squeeing here). In addition, Meryl was totally pwned on radio 2UE where she was asked repeatedly why she was anti-vaccine and tried to avoid the question by saying the AVN does not tell parents what to do, but simply offer the “other side of the story”. Man, it is refreshing to see the credulity gone from the media with respect to the AVN. Only a few months ago, they were unquestionably called upon to offer the “other side of the story” (in other words, false balance) to the vaccine “debate” (there is no debate – the risks from contracting a disease far outweigh the risks of having an adverse reaction to a vaccine). That was the sound of Meryl’s head asploding. And the AVN’s house of cards crashing down. Congrats to Ken McLeod for compiling the HCCC complaint and to everyone who submitted supporting material along the way and to the HCCC for carefully considering and responsibly ruling on the complaint. To Stop the AVN for all their hard work, all the other bloggers and tweeters who have constantly kept the pressure on, and to Steve Cannane for the brilliant story on Lateline. Lets keep slamming that oyster shut. One day it might get permanently jammed.